“Israel-European ties depend on the outcome of peace talks with the PLO, EU Ambassador Lars Faarborg-Andersen”. 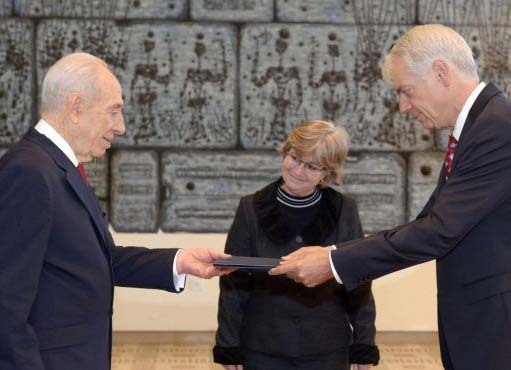 Europe is giving the Jewish the same offer of “peace:” as Nazi-Germany offered. Lars Faareborg-Andersen represent the Post-Christian anti-Zionist Europe. Andersen said this ahead of European Parliament President Martin Schulz’s speech in the Knesset on Wednesday. 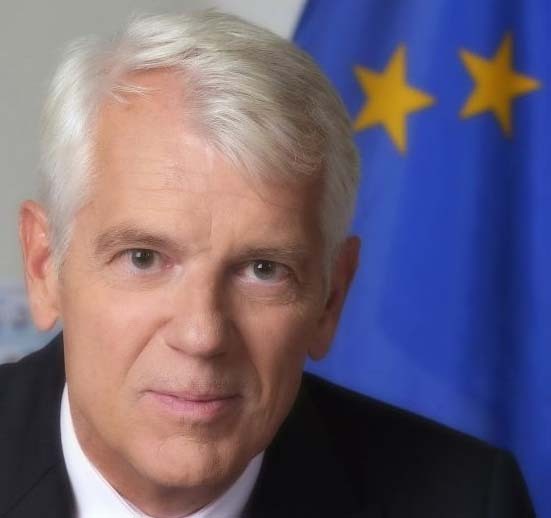 “Israel is an important partner of the European Union and the Middle East peace process is one of the EU’s foreign policy priorities, and therefore a visit to Israel is almost a must for every European Parliament president,” Faaborg-Andersen said on Tuesday. Schulz is scheduled to address the Knesset on Wednesday afternoon and meet with President Shimon Peres and Justice Minister Tzipi Livni. On Tuesday, Schulz met with the Knesset Caucus to solve the Israeli-Arab Conflict, led by MK Hilik Bar (Labor). In 1934, the Jews were forced to chose loyalty either to Nazi-Germany or God of Israel. If they wanted to remain in Europe, they had to renounce the Jewish faith, and be assimilated into the Nazi-cadre. When the Jews did not obey the brown shirts and their leader Adolf Hitler, the Germans started to find a “final solution” to the Jewish problem. Europe died in Auswitch. The civilized and cultured part of Europe was abolished, and replaced by the multitudes support for barbarism. Six million Jews perished by the hands of the European Union of 1933-1945. The Jewish presence in Europe has been replaced by the import of 20 million Muslims. Today’s Europen Union is not so unlike the Nazi European Union, when it comes to the ideology of Anti-Zionism. Israel shall only have a right to exist, if the Jewish nation evacuate from their own mountains of Zion, Jewish districts named Judea and Samaria. This is the Biblical heartland of Israel, with historic roots 3.000 years back in time. Judaism was reigning in Jerusalem 1.700 before the appearance of Islam. It is sad that Europe seems to have leaned nothing from their criminal past. Today it appears that the Nazis succeeded in burning the correct history books in Berlin, and replaced them with a pack of lies. Because, now the curriculums in schools in Europe presents the Islamic narrative to history, which has delete the truth about the city of Jerusalem, the city of God of Abraham, Isaac and Jacob. Thank you for keeping us informed. We echo your prayer; May Jesus the Messiah have mercy on all deceived souls. Thanks for blessing me. Return to sender: Love and grace. I’m interested in your further take on this European desire to end the conflict between Jews and Arabs, which they claim is a priority. I believe the EU will succeed where the US has failed. My feelings are determined by the fact that the ten toes in Daniel are spawned from the two legs of Rome. Further, I believe England will once again be the leader in this process. The below link is a letter written to G. W. Bush by three very well known Rabbi’s who even count Lord James Balfour of England among the “truly righteous”. Thus, there is evidence in this letter that Israel (at least the followers of these three Rabbi’s) would welcome an initiative coming out of England, i.e. from the new King perhaps who will act more pleasing than G. W. Bush? Please do not publish external links in the comment field. They will be deleted, and you will be spammed. To claim that England will take over the leadership of the anti-Christian flock, is a bid to protect the Pope and the Jesuits. They have correctly been branded as the main brood of wipers since the Counter reformation in 1540 A.D. The Papacy has been renounced as a seat of paganism by all truly born again Christians since 1518 A.D onwards. The ancient Baptist Church also correctly branded Emperor Constantine as an anti-Christ, and refused to bow before the Papacy, but rather accept martyrdom and being burnt at the stake. Sorry about the link but it was the only way to get you the letter. I agree the Papacy has fallen away from the truth from at least 600 A.D. when Pope Gregory the Great wrote that if any bishop claimed to be “Universal”, above all other bishops that person would be the precursor of the Antichrist. Every Pope after Gregory the Great has accepted this infamous title and are at a minimum all false prophets. The Antichrist will be a political leader and the Pope will be the False Prophet that supports this man of sin and eventual world leader. The entire statue in Daniel is made up of world rulers, not religious leaders. The Pope would rush to crown Prince Charles as King if he could get recognized as the leader of the whole church in the world. Very similar to when Charlemagne was crowned in the 800’s. This is my thoughts on the subject and I’m willing to respond to any questions. No Ivar, its not a bid to protect the Pope. Its a bid to bring scriptural correction to this mistaken claim that the a Pope will be the Antichrist. The Pope is head what is rapidly becoming the one world church that is depicted in Revelation as the woman who rides the beast – That Great Harlot, who is prophesied to be destroyed by those who give power to the Antichrist. As The Pope is at the head of that Harlot church, they would be destroying the man (or at least the power base) of the man you say is the Antichrist. It is sufficient that you expose him for what he is – the leader of the great harlot. To call him the Antichrist is to fall into the deception. Many anti-Christs have walked on the Earth. Many of them denying that the Pope’s are among the them. The Pope (whether current or future) can be “an” anti-christ (1 John 2, 4 & 2 John1), yet not “the” anti-christ (2 Thessalonians 2, Revelation 13). The Pope could be “the” false prophet – while also being “an” anti-christ (Revelation 13, 16). If the Pope is not a king, than there are no kings on Earth. The Pope is presented as the King of Kings, who rules in the state of states. The Vatican statehood. The Vatican lays claims to all the kingdoms on the face of the Earth, and even has a seat in the UN. The British throne has today no power. It is the seat of an empire that has collapsed. The Papacy has not collapsed. The Pope has ambassadors in almost every nation, and all the nations have sent their ambassadors to the ‘Holy see”. And the Pope is “in place of Christ”. The Vicarius Christi, or the Vicar of Christ. Shalom va baruchot, achi. Toda raba. At least we agree on this point and I’m more than willing to support this thought because of Scriptural confirmation. My response may be confusing on who I support, but I support Phil as I doubt the Pope will be the Antichrist. I believe the man of sin is a political leader, plus I could never see Israel trusting the Pope or listening to the Pope about their spiritual condition or the Pope taking charge in Jerusalem. Kings of Israel were forbade to act as Priests (1 Sam 13). Only Jesus Christ will fulfil both roles when he takes the throne of David. incidentally, I read somewhere that the law of the Church of Rome forbids Popes to be kings. But there is currently one throne that claims the position of both High Priest and King. That is the throne Prince Charles is heir to. Henry VIII took that position of Head of the Church In 1534, when the English Parliament passed The Act of Supremacy that separated England from the Catholic Church and Papal authority. I would expect one who comes in the place of Christ to claim the position of both king and high priest. You said: “If the Pope is not a king, than there are no kings on Earth. The Pope is presented as the King of Kings, who rules in the state of states. The Vatican statehood. The Vatican lays claims to all the kingdoms on the face of the Earth, and even has a seat in the UN. God knows the difference between the Prince of the People who destroyed Jerusalem and the Pope. He also knows the difference between the Beast and The Harlot who rides it. Was the Pope the king during the time of the Holy Roman Empire? Or were there kings who elected one of themselves as Emperor? I have never seen anything come out of the Church of Rome that could be construed as a claim that the Pope is the king of any country. The Vatican doesn’t have a king, just like the USA doesn’t have one. If we take your allegorical approach to what God tells us we can make just about anyone fit the bill. With regard to the British throne. I suggest you spend some time (as I did) studying the subject. To begin with, the British queen is still head of state of far more countries than that little Island, which incidentally, also has ambassadors in just about every country. They are also at the head of freemasonry. Do you seriously think there is no power in that organisation?